I say "Family Picnic" loosely because I don't recognize ANY of the other people! The woman standing could be my cousin MaryJo, but it's difficult to tell. Now that I look a little closer it's possible that the man on the right is my Grandmother's second husband, John. Perhaps this is mostly his family and that is why I don't recognize anyone. Despite really only knowing one person in the photo I love this photo. I love the sense of place that is preserved: the beautiful trees, the 1950's cars in the background, the people at the other tables, and the light and shadow caused by the trees. Mostly, however, I love the sour look on Mom's face. She doesn't look very happy that her picture is being taken. She didn't like her picture taken if she didn't look perfect. (Who doesn't?!) But even with the sour look I think she looks sweet and beautiful. I like the photo also, it reminds me of my childhood. It actually looks like a family picnic we had at Ft. Churchill on the Carson River. Pine trees replaced by big old cottonwoods. 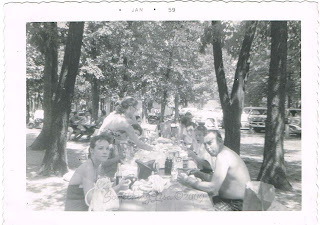 We also had on our swimsuits as we would swing from an old tree into the river and were famished and eager for lunch. I miss my family. I love family picnics too.